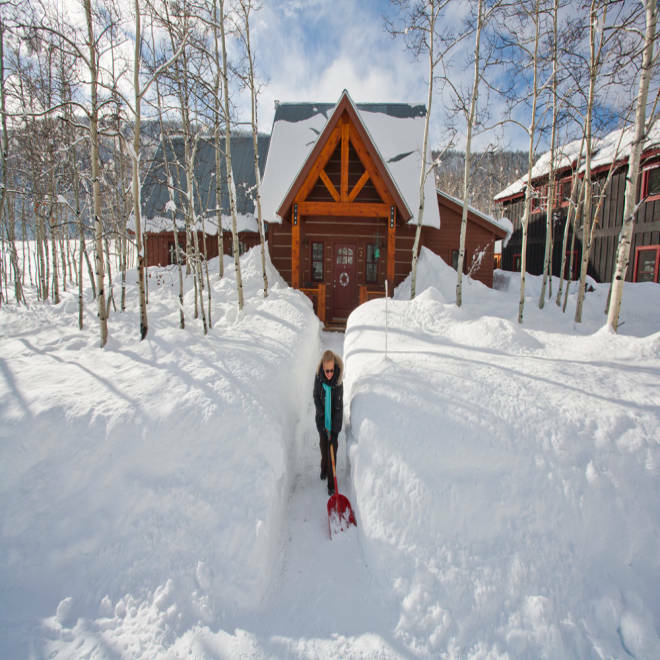 Kim Walter clears a path from her home to the road, Dec. 23, 2010 in Crested Butte, Colo. But is it the U.S. town with the most yearly snow? We examined 30-year average annual snowfall data from NOAA's National Climatic Data Center to come up with a list of America's Six Snowiest Cities. We limited the list to cities with populations of at least 1,000 as of the latest census data. Unincorporated towns, mountains, national parks and ranger stations were not included. Keep the above big city snow totals in mind as we kick off with #6. Tucked in the foothills of the Adirondack Mountains, Boonville, the self-proclaimed "Snow Capital of the East," represents one of America's most prolific snowbelts. Cold winds with a westerly component traveling over 193-mile long Lake Ontario pick up moisture and wring out epic snowfall not only on the immediate shoreline (Oswego to Watertown), but also the Tug Hill Plateau and Adirondack foothills. So-called "orographic lifting" of this moistened flow by the terrain only adds to the snow totals. Incredibly, the 2010-2011 season "only" delivered just over 10 feet of snow. I say "only" because that's just under 6 feet less snowy than the average. I don't know how long it takes you to clear snow from your driveway, but you could envision the part of the driveway you started on already filled back in as you finish the last section in this snowstorm. Quick question: Name a region with a reputation for heavy snow? Did you answer the Rockies? New England? The Great Lakes snowbelts? Cascades or Sierra? Alaska? I'll bet the Black Hills of South Dakota wasn't one of your answers. But it should be. Lead (pronounced LEED), and its sister city, Deadwood, are in the northern Black Hills. North winds circulating around powerful Plains storm systems are lifted by the hills, wringing out prolific snow totals well over 10" three to four days a year, on average. An incredible 5-day snowstorm once dumped over 112" in Lead in late February/early March 1998. That's over 9 feet or more than double the average annual snowfall in Denver... in one snowstorm! What other location in the U.S. averages over 20" of snow... in six different months (November through April)? Two spring months, March (35") and April (34"), are Lead's snowiest months! How many places average almost 1" of snow... wait for it... in June? There was once 10" of snow on the ground on June 2! Few places in the U.S. have such a deadly history with regard to epic snowstorms as the Sierra Nevada range in California. The most infamous story was that of the Donner party. An early-season snowstorm trapped the 87 pioneers near Truckee, below the pass that would later be renamed for them, for much of the winter of 1846-1847. Less than 50 survived the ordeal. In early April 1880, a spring storm dumped an unfathomable 16 feetof snow in just 4 days near Donner Summit. This is thought to be a world record snowstorm total. A snowslide near Emigrant Gap, buried railroad tracks under 75 feet of snow, ice, and rocks. Incredibly, 783" of snow (over 65 feet) was measured that season of 1879-1880. A bit more recently, a passenger train with 226 aboard headed to San Francisco was trapped by two huge snow slides in drifts 8-12 feet deep on January 13, 1952. A daring rescue freed the passengers after 3 days marooned in the Sierra, just before food and other supplies ran out. Want more "wows"? South of Truckee and just outside Yosemite National Park, Tamarack, Calif., once measured a snow depth of just under 38 feet in March 1911! This same location once measured a whopping 884" (73.7 feet) of snow in the 1906-07 season. A typical Sierra winter storm will dump several feet of snow in just a few days. These storms can shut down I-80 over the Sierra. The bright side to this incredible snowfall is that it fuels a healthy number of Sierra ski resorts. There's something to be said for a place east of the Rockies that not only endures long, harsh winters but, in some ways, celebrates them. As Exhibit A, I submit Upper Michigan's Keweenaw Peninsula. Look, it's easy to get snow-weary up there. The town averages a whopping 56" of snow in December alone, and almost 66" in January! That's more than the average annual snowfall in both Minneapolis and Denver! They once had over 2 feet of snowfall on a March day (Mar. 4, 1985), and had 2" of wet snow on June 2, 1945. Of course, a lot of this can not only be blamed on the northern latitude, but also nearby Lake Superior. Winds with a northerly component elsewhere in the Upper Midwest may simply be cold, but in this part of Upper Michigan, they generate more snow, as they pick up moisture from the lake. Hancock's sister city across the Portage Canal, Houghton, is home to Michigan Tech. University. The school's alumni website tracks both current snowfall and historical records. What other school without a meteorology department tracks this? They also mention "snowball fights across Highway 41" and have an annual "guess the season snowfall" contest. Just up the road in Keweenaw County, there's a roadside marker that clearly illustrates how much snow can fall. In the 1978-79 snow season, a whopping 390" of snow fell at this location. That's over 32 feet! See ... it's a mindset. The snowiest location east of the Rockies. No problem, embrace it! Nestled in a valley at an elevation of 8,860', the town of Crested Butte, Colo., owes their lofty perch on our list to often lying in the primary storm track from mid-fall through spring. At least 30" of snow is par for the course each month from November through March. It has snowed as early as Labor Day and as late as June 26 in the historical record. You'll see that wonderous powder fall 67 days in a typical year. The New Year's holiday has been notoriously snowy here. New Year's Eve 1923 had a record snow depth of 10 feet, while New Year's Day 1982 was the town's record snowiest calendar day (31"). Some "number-ones" edge out the competition by a nose. A photo finish in the Kentucky Derby. A last-second field-goal in the Super Bowl. A home-run in the bottom of the 9th in Game 7 of the World Series. Then, there are the "blowouts". Valdez, AK clobbers the competition as America's snowiest city. Their annual average snowfall bests our #2 city, Crested Butte, Colo., by over 9 feet! It may be hard to fathom how much snow this is, so I'll present a simple comparison. Imagine creating one giant snowpile 326" high, without compaction. (This would make for a dangerous game of "King of the Hill", eh?). The height of this snowpile...just over 27 feet! They've had 100" of snow in 5 different months! They once had 180" of snow in just one month! That's almost 5 times the average annual snow in Chicago! Want to see what 100" on the ground looks like? That happened twice in the same year (1990). Only 215" of snow was measured in the 2010-2011 season, roughly 110" below average! In December 2009, Valdez was swamped by one of those almost biblical storms. Over 3 days, an incredible 68" (that's 5 feet, 8 inches, folks!) of snow buried the town. Snow was piled on the side of city streets 3 to 4 feet high. At that point, you can call those piles "berms". If you own a boat on the harbor, well, you can't let the weight of that snow accumulate on the deck. The weight of the snow could sink it, if pumps don't work properly. That's what happened to at least one boat in the harbor during this incredible Dec. '09 storm. Why do they get so much? First, Valdez is surrounded by mountains. These mountains don't completely block cold air in the Alaskan interior from reaching Valdez. Instead, north to northeast winds channel through mountain valleys. Cold air can also drain from glaciers and mountain snowfields into the city, especially at night. Secondly, one of the most common low pressure systems on the planet, the "Aleutian low", sets up camp to the southwest of Valdez in the colder months. When this happens, copious Pacific moisture pumps into southern Alaska. If cold air is in place, as described above, you guessed it, heavy snow results. Wendy put it best. Valdez shrugs off these storms. They "deal with it". Life goes on. Coming from a city that "freaks out" over the forecast of a snow flurry, I find that quite refreshing. The Great Alaska Earthquake of 1964 lead to a collapse of the city's harbor and docks. Three years later, Valdez was relocated about four miles west. A major factor in the planning back then was removing snow. Wide streets were laid out, and the city has an impressive arsenal of snow-removal equipment.